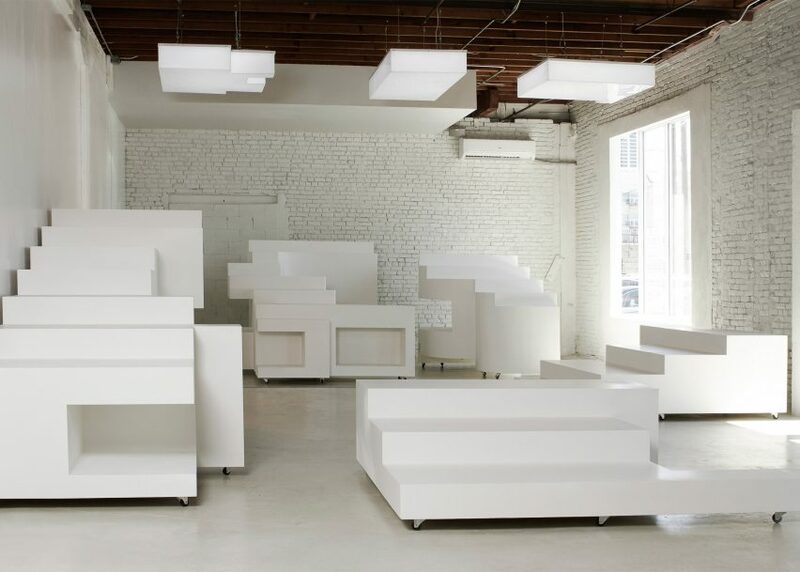 White display stands inside this Los Angeles boutique designed by Bureau Spectacular fit together like a puzzle, forming a set of steps for events and performances. The local firm created the store for fashion company Frankie, formerly known as Frankie B and recently relaunched by founder Kevin Chen. 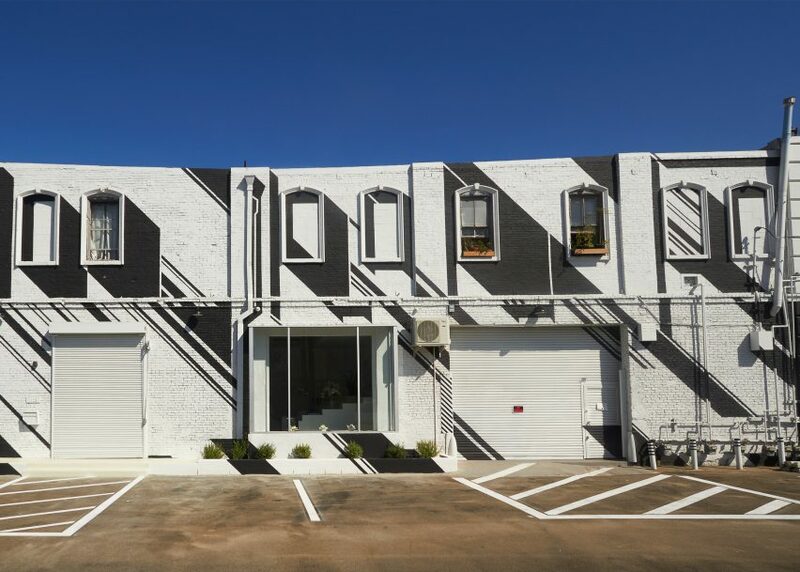 Its new 2,000-square-foot (186-square-metre) space in Downtown LA's Arts District features an exterior covered in black and white graphics by Bureau Spectacular's Jimenez Lai. Inside, the studio has placed nine white, boxy pieces around the store. These moveable elements provide display stands, clothing racks, changing rooms, storage compartments and cashier desk. When all brought together, they form a set of stairs that can act as bleacher seating during events held in the space. The 28-foot-long (8.5-metre) staircase is also designed to be used as a catwalk or a performance stage. "The innovative store interior has been outfitted with one of the firm's iconic Super-Furnitures, a structure too small to be a building but too large to simply be a piece of furniture," said Bureau Spectacular. The rest of the minimal interior includes white-washed brick walls and concrete floor. Light boxes suspended from the ceiling mimic the irregular shapes of the floor units, while a mirrored wall at one end creates the illusion of more space. "The vision behind the store's design takes inspiration from an earlier project of Lai's titled Briefcase House – a house within a house located inside a 1,400-square-foot Chicago warehouse loft," said the studio. The retail space features products from the Frankie line, as well as fragrances, candles, accessories, and books from other companies. Frankie is located at 1129 East 5th Street in the Downtown LA Arts District, not far from a new Hauser & Wirth gallery that opened earlier this year. Bureau Spectacular was founded by Lai in 2008, and has previously filled a Venetian palazzo with nine colourful structures representing different domestic functions. Photography is by Injee Unshin.